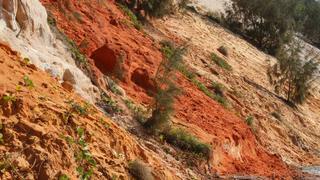 As the name suggests, Rainbow Beach offers visitors a spectacle of colour. Formally known as Black Beach, the area was renamed after its many-hued sand dunes. Its kaleidoscopic appearance is created as a result of the high mineral content in the sand, and is said to contain up to 72 different colours in total. Aboriginal legend tells that the beach’s multi-coloured dunes are a result of the tragic death of Yiningie, the spirit of the rainbow. Situated at the edge of Great Sandy National Park, visitors to Rainbow Beach are invited to enjoy the natural surroundings through a variety of activities such as fishing, surfing and horse riding along the coast. 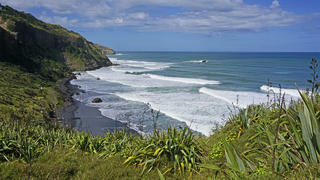 Rainbow Beach is also a great spot for diving, as whale and dolphin sightings are common in the waters nearby. How to visit: Located 238 kilometres north of Brisbane, Rainbow Beach is the perfect stop off for anyone cruising up Australia’s North East coast towards the Great Barrier Reef. Superyachts up to 80 metres can moor at the Rivergate Marina in Brisbane, which is approximately three hours away by private car, or drop anchor off Rainbow Beach and tender to shore. As the name suggests, Rainbow Beach offers visitors a spectacle of colour. Formally known as Black Beach, the area was renamed after its many-hued sand dunes. Its kaleidoscopic appearance is created as a result of the high mineral content in the sand, and is said to contain up to 72 different colours in total. Aboriginal legend tells that the beach’s multi-coloured dunes are a result of the tragic death of Yiningie, the spirit of the rainbow. Situated at the edge of Great Sandy National Park, visitors to Rainbow Beach are invited to enjoy the natural surroundings through a variety of activities such as fishing, surfing and horse riding along the coast. Rainbow Beach is also a great spot for diving, as whale and dolphin sightings are common in the waters nearby. How to visit: Located 238 kilometres north of Brisbane, Rainbow Beach is the perfect stop off for anyone cruising up Australia’s North East coast towards the Great Barrier Reef. Superyachts up to 80 metres can moor at the Rivergate Marina in Brisbane, which is approximately three hours away by private car, or drop anchor off Rainbow Beach and tender to shore. Dominica's volcanic landscapes mean that the picturesque island, which is nicknamed the Nature Island, has its fair share of black beaches. Perhaps the most notable, as the name suggests, is Number One Beach, which is located on the north east shoreline of the island. 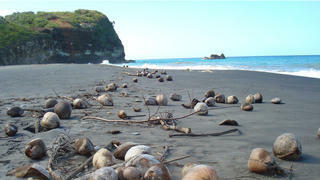 The beach is so striking that is was chosen as a filming location for the Pirates of the Caribbean movie Dead Man's Chest. While there is not much to do on Number One Beach, apart from take in the spectacular scenery, there is plenty to keep you entertained in Dominica. From experiencing Champagne Reef, a destination that should be on every diver's bucket list, to rowing up the tranquil Indian River there is a host of nature-based activities to enjoy. How to visit: While there are limited superyacht facilities on the island you can drop anchor in the protected Rupert Bay and tender in to enjoy all that Dominica has to offer. Dominica's volcanic landscapes mean that the picturesque island, which is nicknamed the Nature Island, has its fair share of black beaches. Perhaps the most notable, as the name suggests, is Number One Beach, which is located on the north east shoreline of the island. The beach is so striking that is was chosen as a filming location for the Pirates of the Caribbean movie Dead Man's Chest. While there is not much to do on Number One Beach, apart from take in the spectacular scenery, there is plenty to keep you entertained in Dominica. From experiencing Champagne Reef, a destination that should be on every diver's bucket list, to rowing up the tranquil Indian River there is a host of nature-based activities to enjoy. How to visit: While there are limited superyacht facilities on the island you can drop anchor in the protected Rupert Bay and tender in to enjoy all that Dominica has to offer. At the southern end of the Greek island of Santorini sits Red Beach, where sand is made of solidified lava from the volcanic caldera. The beach is small and secluded with loungers, umbrellas and has some rustic tavernas built into the caves at the base of the cliffs. Red Beach is also a wonderful snorkelling spot and there are a number of rocky hiking trails around the surrounding cliffs. The island of Santorini is also home to Black Beach and White Beach, both named for their extraordinary sand colours. How to visit: Drop anchor off the coast of the island and tender to shore to explore Santorini’s multicoloured cliffs and some of the best beaches in the Mediterranean. At the southern end of the Greek island of Santorini sits Red Beach, where sand is made of solidified lava from the volcanic caldera. The beach is small and secluded with loungers, umbrellas and has some rustic tavernas built into the caves at the base of the cliffs. Red Beach is also a wonderful snorkelling spot and there are a number of rocky hiking trails around the surrounding cliffs. 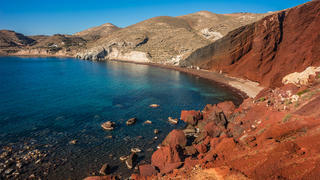 The island of Santorini is also home to Black Beach and White Beach, both named for their extraordinary sand colours. How to visit: Drop anchor off the coast of the island and tender to shore to explore Santorini’s multicoloured cliffs and some of the best beaches in the Mediterranean. 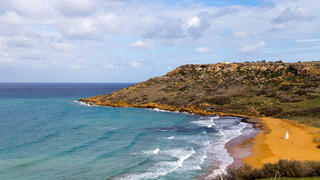 If you're spending a few days exploring Malta by superyacht, head to Ramla Bay — it's the largest sand beach on Gozo and features a stunning reddish-gold shoreline. It's refreshingly underdeveloped, with only the odd beach bar and kiosk selling drinks, ftira or ice cream. Swim, snorkel, sunbathe and explore the famous Calypso Cave, a series of caves referred to in The Odyssey by Homer as the home of a nymph. How to visit: Superyachts up to 60 metres can moor up at Mgarr Marina — arrange for a car to pick you up from the marina and drive you the short journey to Ramla Bay. Otherwise, there are some good anchorages around the island to drop anchor and tender to the beach. If you're spending a few days exploring Malta by superyacht, head to Ramla Bay — it's the largest sand beach on Gozo and features a stunning reddish-gold shoreline. It's refreshingly underdeveloped, with only the odd beach bar and kiosk selling drinks, ftira or ice cream. Swim, snorkel, sunbathe and explore the famous Calypso Cave, a series of caves referred to in The Odyssey by Homer as the home of a nymph. How to visit: Superyachts up to 60 metres can moor up at Mgarr Marina — arrange for a car to pick you up from the marina and drive you the short journey to Ramla Bay. Otherwise, there are some good anchorages around the island to drop anchor and tender to the beach. One of the best beaches in the Caribbean, Pink Sands Beach is said to turn a pale shade of salmon at sunset due to a fine mix of Foraminifera (microscopic coral insects), broken shells, coral pieces and calcium carbonate. 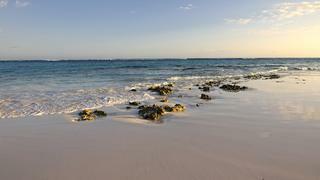 Swim and snorkel along the nearby coral reef or indulge in an afternoon of horseback riding along the dunes. Otherwise, there are plenty of watersports on offer, such as diving, windsurfing, waterskiing and kayaking. How to visit: Harbour Island is a relatively quiet destination that is only accessible by boat, so choose one of the nearby anchorages and tender to this idyllic spot. One of the best beaches in the Caribbean, Pink Sands Beach is said to turn a pale shade of salmon at sunset due to a fine mix of Foraminifera (microscopic coral insects), broken shells, coral pieces and calcium carbonate. Swim and snorkel along the nearby coral reef or indulge in an afternoon of horseback riding along the dunes. Otherwise, there are plenty of watersports on offer, such as diving, windsurfing, waterskiing and kayaking. How to visit: Harbour Island is a relatively quiet destination that is only accessible by boat, so choose one of the nearby anchorages and tender to this idyllic spot. The western coast of New Zealand's North Island is famed for it's black sand beaches and Muriwai is one of the most dramatic. Popular with surfers, the long volcanic sand shoreline is also home to a large colony of gannets, approximate 1,200 pairs, which nest atop the cliffs from August to March. Visitors can simply walk along the 60 metre beach, partake in a surf lesson, hire a kite or take a mountain bike out for some onshore exploration. How to visit: Superyachts up to 34 metres can moor up at Hobsonville Marina or anchor just outside of Auckland, just a 40 minute drive from the rugged west coast beaches. The western coast of New Zealand's North Island is famed for it's black sand beaches and Muriwai is one of the most dramatic. Popular with surfers, the long volcanic sand shoreline is also home to a large colony of gannets, approximate 1,200 pairs, which nest atop the cliffs from August to March. Visitors can simply walk along the 60 metre beach, partake in a surf lesson, hire a kite or take a mountain bike out for some onshore exploration. How to visit: Superyachts up to 34 metres can moor up at Hobsonville Marina or anchor just outside of Auckland, just a 40 minute drive from the rugged west coast beaches. Crystal clear waters wash up beautiful blush pink sands in Horseshoe Bay, and it has long been one of the favourite natural attractions of Bermuda. Explore the dramatic caves surrounding Horseshoe Bay or play a game of volleyball on the sand. It's an extremely child-friendly spot as there's an enclosed section that is protected from large waves. Additionally, your can hire snorkelling equipment, beach chairs, waveboards and boogie boards. Avoid peak times to enjoy the beach in peace and head to one of the many eateries along the beach front serving up local and international cuisine, as well as delicious rum cocktails. How to visit: Superyachts up to 152 metres can moor at the nearby Hamilton Princess Marina and luxury yachts up to 91 metres can berth at St George's Harbour Marina in the north-west of Bermuda. Crystal clear waters wash up beautiful blush pink sands in Horseshoe Bay, and it has long been one of the favourite natural attractions of Bermuda. 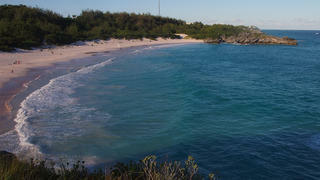 Explore the dramatic caves surrounding Horseshoe Bay or play a game of volleyball on the sand. It's an extremely child-friendly spot as there's an enclosed section that is protected from large waves. Additionally, your can hire snorkelling equipment, beach chairs, waveboards and boogie boards. Avoid peak times to enjoy the beach in peace and head to one of the many eateries along the beach front serving up local and international cuisine, as well as delicious rum cocktails. How to visit: Superyachts up to 152 metres can moor at the nearby Hamilton Princess Marina and luxury yachts up to 91 metres can berth at St George's Harbour Marina in the north-west of Bermuda. Picture courtesy of Shutterstock.com / Ines Porada. Words by Olivia Michel.